Cherry Lash Eyelash Extensions are individual, synthetic lashes. They are attached to your eyelashes individually and not to your skin—it’s an intense process. Once properly applied, these lashes are so natural-looking it’s difficult to tell even up close that you have extensions on. We offer 30 different unique lash options to customize your look. Our lashes offer two-degrees of curl, three different thicknesses, seven different lengths, and they’re virtually weightless. If the technician is not properly trained and qualified, eyelash extensions could possibly damage your lashes, leaving you with unsightly “bald spots.” Results depend upon the skill of your technician and the product that is used. Even if they are certified, very few “extensionists” do eyelashes more than once a month. This procedure is new to the United States and not yet regulated, which makes it easy for opportunists to call themselves eyelash extension specialists. Additionally, many salons use manufacturer “stock” photos, so oftentimes the photos aren’t actually representative of the salon’s skill level. Even if they are certified, most other eyelash salons offer a wide array of other beauty services, the demands of which makes it difficult for them to truly specialize in eyelash extensions. Always ask your technician to show you their certification and which product (and safety certifications) they use. Cherry lashes will stay on your natural lashes for their remaining natural lash life. A normal lash growth/shed cycle is between 30 and 60 days. Most people shed natural lashes at a rate of one to two lashes per day, per eye. Our bodies will naturally grow a new lash to replace the one that fell out. Cherry lashes can stay on up to 60 days with proper care, and with monthly maintenance, you can keep your beautiful eyelashes forever. However, general after-care will affect how long the lashes last. The average lash professional charges between $300 and $600. However, at Cherry Lash, we offer full sets to new clients starting at just $59. We pride ourselves on being able to serve any client at any price point. See our pricing page for a detailed list of services that won’t break the bank. Our rigorously tested lash adhesive is sourced from our lab to create a polypeptide bond, specifically made for human lashes. The adhesive dries very soft on lashes, allowing the lashes to stay flexible and bouncy, just like your own. The extensions will adhere to your natural lashes safely and comfortably without damaging your natural lashes or causing them to fall out. Please do NOT remove the eyelash extensions on your own. Everyone from busy moms and working women to brides and celebrities. If your time is precious and you want your eyes to look flawless all day every day without worrying about mascara smears or clumps, and without wrestling with eyelash curlers, Cherry Lash extensions are for you! These eyelash extensions naturally darken your lashes, so mascara is NOT necessary. Rubbing and pulling at the lashes, or using mascara remover will weaken the bonding and may cause the extensions to twist and fall out. We strongly recommend that you avoid wearing mascara or using eyelash curlers. If you must, we suggest using only water-soluble mascara. Yes, at any time and for any reason! They can easily be removed by a Cherry Lash extension artist. Please do not attempt to remove lashes on your own, as you can damage your natural lashes this way. 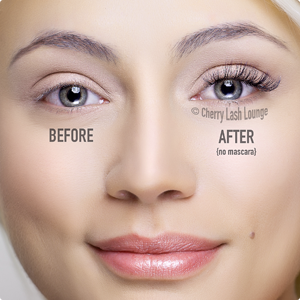 We are happy to help you with removal at Cherry Lash. 1. Remove all eye makeup and clean your lashes with mild, oil-free cleanser, or a Cherry Lash lash artist will do it for you. 2. Please don’t use oil-based makeup removers to clean your lashes prior to the application. 4. Please remove contact lenses prior to your appointment. 5. Set aside two to three hours for your full set appointment, or one hour for your touch-up appointment. Many of our clients fall asleep during the procedure. They are always amazed when they wake up with gorgeous looking lashes! After-Care: I got my lashes! Now what? 1. Do not rub or scratch your eyes. 2. Do not pull on your lash extensions — you might take out your natural lash as well. 3. Avoid creams, eye makeup removers, lotions, or cleansers that contain oil, as they can loosen the bond of the lash extensions. 4. Take care to apply eye cream sparingly, carefully avoiding the lash line area. 5. Avoid direct water spray on your extensions in the shower. Do not use a steam bath, swim, or wash your face directly with hot water during your initial 48 hours of the application. 6. Do not use a regular eyelash curler; it may break both the lash extension and your natural lashes. What happens if a lash becomes loose or falls out? Do not pull on the lash. Contact Cherry Lash to have them replaced. Your lashes will fall out due to their natural growth cycle, and you will need touch-ups every three weeks as the new ones grow in. As your natural lashes become accustomed to the extensions, and proper care and maintenance, the time between refills can be extended.